Size 50 mm, with a 30 mm Split Ring. 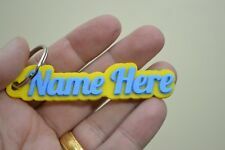 Personalised Rubbery 3D Keyring's! Your Personalised item's. Personalised Dual Colour Keyring. Choose your base colour and your txt colour from the colours below. With our 3D Printed and very Flexible (TPU) Rubbery material you can drop it, step on it squeeze it and will retain is normal shape! This keyring is not just only can hold your keys and also is a great decoration. 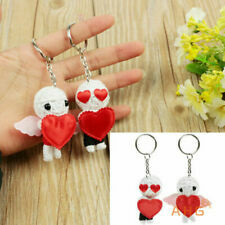 Features: Couples Keyring Set. 2pcs Key Chains. Main Colour: Red & White. We will be glad to reply and help you to solve any problem. 1 x Kitty with pink bow and no glasses. 1 x Kitty with glasses and blue bow. So should there be any issues, I can provide you with a copy to view. 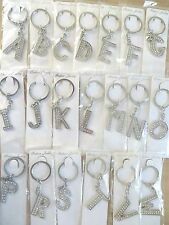 Each have small chain which can be used to attached to keyring. TINKERBELL KEYRING FAIRY KEYCHAIN IMAGINE BELIEVE ACHIEVECHARM IN GIFT BAG. ENGRAVED SILVER KEYRING. Glitter Shake Alpha Keyring smiggle. Condition is New with tags. Dispatched with Royal Mail 2nd Class. Price is for one keychain, the photo shows both sides. Unicorn Keyring. Ideal gift for a Unicorn lover! Smiggle E keyring. As new, never used. From a smoke free and pet free home. Billy Bag London Key Ring. Leather heart shaped design in Pink on large silver ring with photo holder. SWIVEL CLASP KEY RING KEY CHAIN STRONG. LITTLE MIX. GIFT BOXED. SILVER PLATED. AND KEY RINGS. ROUND PENDANT 25 MM. SO IDEAL TO GIVE AS A GIFT. STRONG LARGE DOUBLE SIDED RUBBER PONY. MY LITTLE PONY. MORE MY LITTLE PONY KEY RINGS. REALLY STRONG FOR THOSE LITTLE HANDS. NICELY PRESENTED SO IDEAL TO GIVE AS A GIFT. DISNEY DESCENDANTS EVIE (daughter of the Evil Queen) QUALITY silver colour KEYCHAIN. Fab gift for your Descendants fan. I ALSO HAVE OTHER GREAT GIFT IDEAS LISTED. Lovely handmade little mix keyring, on te top is a clasp. perfect for a bag,present, etc. 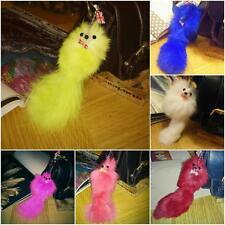 Dotti Fun Fluffy Scented Character Keyring Smiggle. Condition is New with tags. Dispatched with Royal Mail 2nd Class. Sweet dreams Plush cloud bag charm. Cloud Charm. Made from polyester. Wipe clean only. A double sided Compact Mirror. Silver heart keyring - words on one side. Heart size is 22mm x 21mm. 3 x Lego keyrings, bought from legoland. Multi Suede OK Circle Purse Keyring. Colour: Multi. Colour may differ slightly due to lighting on the photo. The Joules Junior Suzette Keyring (W). We’ve even added contrast fabric under the feet and ears. Split ring keyring. 100% Polyester Wadding: 100% Polyester. Contrast fabric under ears and feet. This is a very unusual, but very feminine boxed key fob which would make a lovely extra "little" gift. It is very sturdily made and is a good weight. The glass fob is a many faceted sparkly ball making it very attractive. Collect in person from Aylesbury if preferred. All are new and unused.